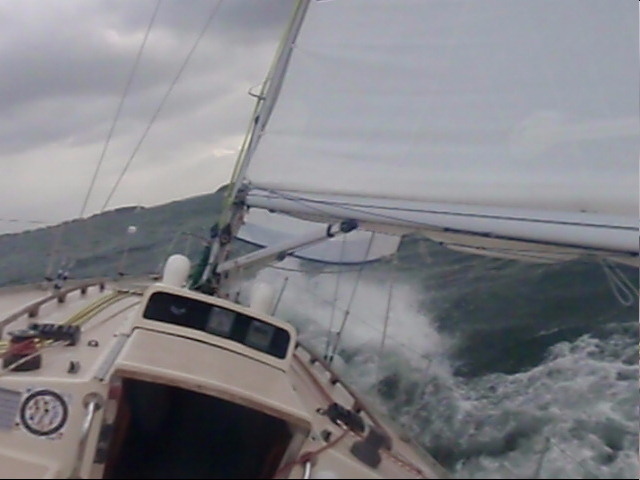 The forecast was a tad ominous....a 25-30 knot southerly with showers so no spinnakers were required for this race! I was glad to see I hadn't completely traumatised Ruth in her first offshore race last week when we experienced gooseneck failure at 25 knots. My dedicated crew returned yet again for more punishment...er ... racing this week. I repaired the gooseneck with a longer bolt that is welded to the reefing horns, secured with a locknut and split pin making it good for another 30 years. 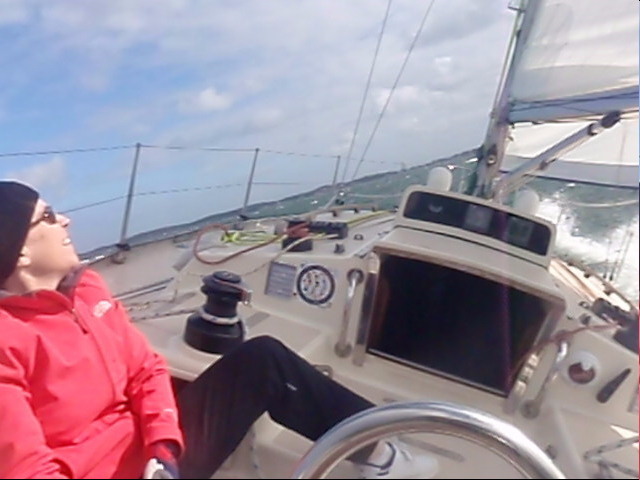 RW headed over to the starting area under reefed main with Ruth on the helm. About 11 yachts milled around the start line in the gusty weather. Being a southerly, we positioned ourselves mid-line so as not to be in the lee of Soldiers Point at the start but high enough to windward so we could lay the first mark without pinching. With just a #1 reefed main we could easily hit 6.5 knots, so we didn't unfurl the headsail to a #3 headsail until about 30 secs before the start. Once racing we quickly picked up several places to be 5th shortly after clearing the line for the beat to the first mark at Salamander. 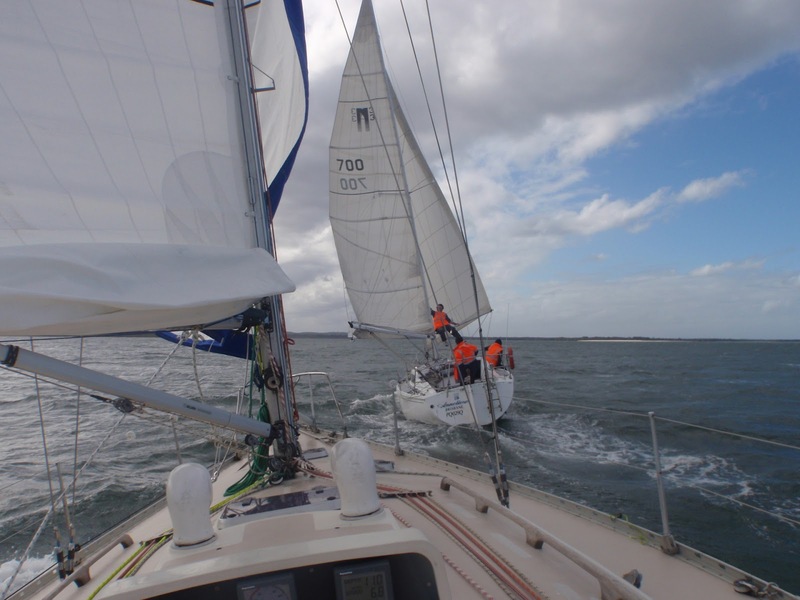 Anneliese (Northshore 33), Exalte (X-332), Goodlife2 (Beneteau 39) and Thief of Time (S80) led the way, however we were to windward with good balance and speed. Once RW was in the groove we switched positions with Kev back on the helm and Ruth providing the muscle! By the first mark we had picked off Goodlife2 and Thief of Time and Exalte had knocked off Anneliese, and we were now all over her like a rash. Rounding the mark in 3rd we unfurled all the genoa and goosewinged the sails in the blustery 20-25 winds. Constantly touching 7-7.2 knots we maintained the gap to just a few metres. The crew of Anneliese were looking nervously over their shoulder as they worked hard to stay in front of an intimidating RW. 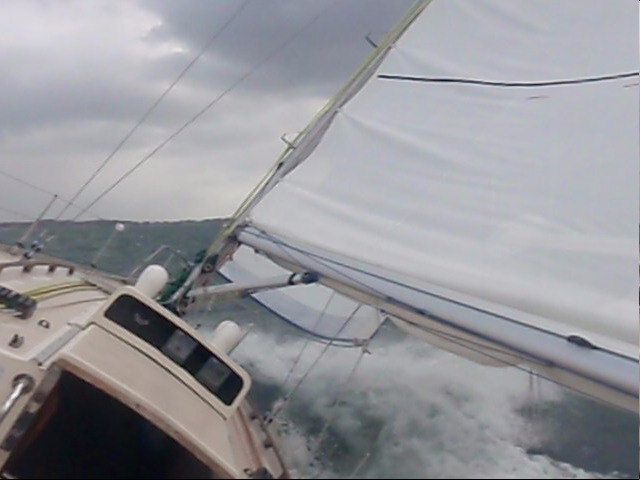 With more crew onboard, they like Exalte had poled out the jib to keep it full. One lucky crew had been 'volunteered' as pole ballast....Ruth kindly informed me she had no desire to undertake that position (see pic)!! I had intended to run the pole (with downhaul), but with a building, gusty breeze I opted to keep it simple as there were only the two of us. Approaching the second mark we ducked behind and to windward of Anneliese to setup for the port rounding. They maintained course as we sailed deeper and then gybed. With the headsail once again furled to a #3, Ruth trimmed hard for the new beat. We started our approach and hardened up with a wide entry to the mark at speed, with the plan to exit close and pop out to windward of Anneliese and overtake her as they would need to exit wide. Well we didn't need to worry......unfortunately Anneliese took themselves out with a beautiful round-up broach right in front of us leaving just enough room for RW to speed on past.....wish I had the camera out for that one as I had a great view of her keel as she laid over on her ear! This not only allowed us to make great distance on them, but by the time they had sorted themselves out Goodlife2 had also slipped past! So now we were second and chasing down Exalte to windward. Ruth was delighted with the 'fresh' breeze evidenced by the grin on her dial....slanderous comments about her being the 'wind jinx' can no longer be accepted! Having opted out of the upper body session at the gym this morning, Ruth was getting a great workout trimming both the main and headsail. I'm sure Ruth will agree it will be great to get Daz back for that extra horsepower! The chase on Exalte was a good one for the remainder of the race, however we could not match the speed of the lighter yacht. Exhalte is about 900mm shorter than RW however our waterline lengths are the same (same hull speed). The X-332 is 2 tonnes lighter than a Sigma 36 so we really need to get it all together to beat her. We eventually finished only several minutes behind her to take 2nd over the line and 5th on handicap. More importantly on handicap they came ninth so I was again very happy with our consistent performance. 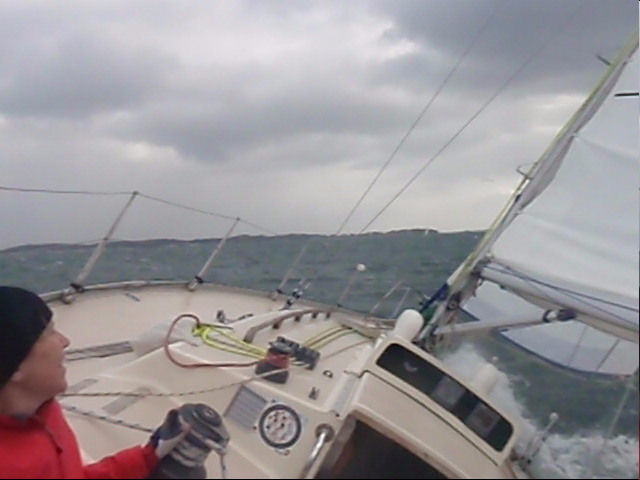 Top speed for the day 8.3 knots with a pleasant 34 knots max wind speed! We are currently running 4th in the Winter Pointscore series and Saturdays effort may see RW again tnear the lead as all our rivals finished behind us. In Daz's absence Ruth has really stepped up to the plate and getting a handle on the boat and racing. I have great confidence in my two crew and once Daz is back on board RW will really be humming!